I went to a great Farmer's Market last weekend with a friend. When I got there she said "do you need a bag? I brought a bunch." Except, that she had the recycled shopping bags from the grocery store. So when I got home, I immediately got to work making this for her. It is, in my opinion, the PERFECT shopping bag, and a perfect gift. It's the Green Living Market Bag, by BariJ. You can get the pattern from her directly. It sews up in about 1 1/2 hours (including the cutting), and it looks like a million bucks with your farmer's market haul sticking out of the top. 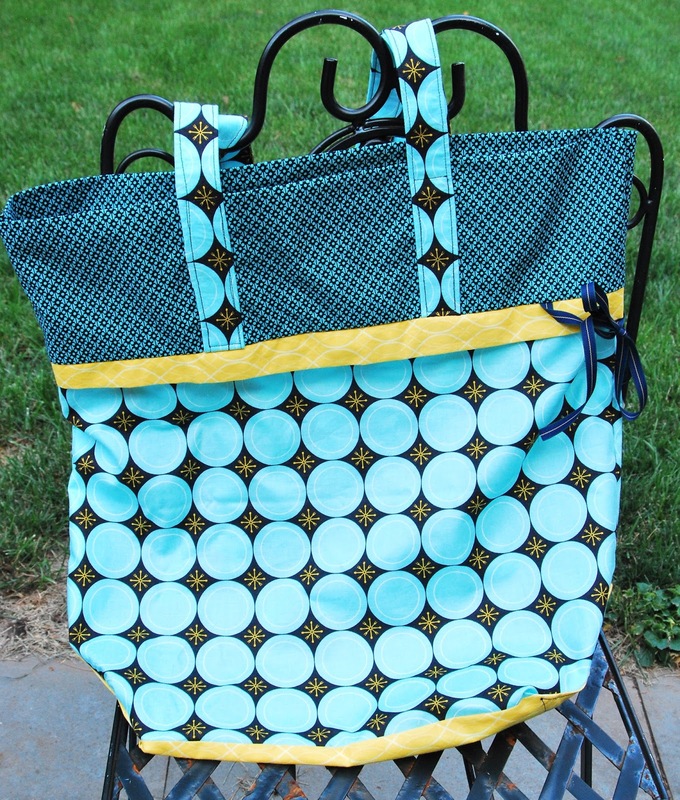 I actually had these fabrics out on my table for another project, and knew they would look great for this bag. I didn't think to try to get the diamonds to go perfectly up the center of the handles, which is why they're off a bit, but they're close enough for me! And here's the best part...it folds up and the ribbon wraps around and it looks like a gift when you hand it to someone. This pattern was designed by my dear friend Bari Ackerman, of BariJ. She currently designs fabric lines for Art Gallery Fabrics and writes THE BEST patterns. What is your favorite sewn gift to give? Last Two Mystery Designer BOM Blocks!